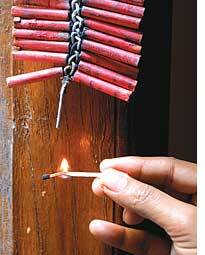 MOST firecrackers in Mumbai violate noise pollution rules. In a recent test the noise levels of 24 firecracker brands were found between 89 and 134 decibel. Noise Pollution (Regulation and Control) Rules, 2000, specify that noise levels in residential areas should not exceed 55 decibel and the Central Pollution Control Board prohibits the sale, manufacture or use of firecrackers generating noise level exceeding 125 decibel. The Maharashtra Pollution Control Board, the Mumbai Police and Awaaz Foundation, an ngo in Mumbai, carried out the tests on October 6. "We found six popular firecracker brands--Star Sutali Bomb, Lalkila, Rajukanna's Mirchi Red, Standard Thunderbolt Gold, Anil dj mix; Charminar Rambo--generating more than 125 decibel. "Not a single manufacturer has abided by a 2005 Supreme Court order that directs manufacturers to mention the chemical composition of a firecracker on the packaging. There is no effort on part of the state administration and the police to implement the rules," said Sumaira Abdulali of the foundation. Abdulali added that the state should not allow such firecrackers to be sold in the city because "there is no clear demarcation of residential and commercial zones". Mumbai Police officials said they would designate one special officer in each police station to deal with noise pollution related complaints. Last year, 568 noise pollution cases were registered during Diwali but since offenders were booked under the Bombay Police Act, 1951, they got away by paying just Rs 100 fine, Abdulali said. The draft Bombay Prohibition and Regulation of Firecracker Rules, 2008, might add deterrence. Mumbai's police commissioner is yet to notify the draft, which combines both the Noise Pollution (Regulation and Control) Rules, 2000 and Noise Standards for Firecrackers, 1999. After the notification, there will be blanket ban on the sale of firecrackers with noise levels of over 55 decibel.